Wearing this most sacred symbol of orthodox Roman Catholicism, the crusaders won a stunning victory against Islam, even though the Catholic kings of the day did not cooperate. What a great undertaking for our crusading Pope Benedict XVI to visit Turkey, clinging with all his spiritual might as Vicar of Christ to this holy Catholic symbol of the cross of Jesus Christ, as he prayed inside the Islamic mosque of Hagia Sophia in Istanbul for a great conversion. 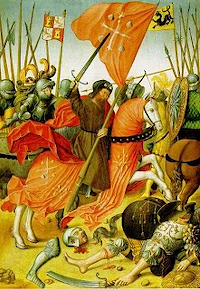 Such heroic courage it takes to risk one's life for the orthodox Roman Catholic faith as the saintly crusaders did centuries ago under the auspices of Pope Urban II and now under Pope Benedict XVI. Certainly our Pontiff Bendict XVI just demonstrated this kind of saintly courage as a 'crusading' pope against Islam! Let us, too, all wear our crucifixes more openly, expressing our belief in Christ's Passion and death and the orthodox Roman Catholic faith, and pray daily for the peaceful conversion of all sinners and Islam. At the minimum let us all wear this great Catholic symbol upon our persons, even if not so publicly. There is no victory but in the cross of Our Lord Jesus Christ. "In hoc signo, vinces" are the words uttered by the great orthodox Roman Catholic emperor Constantine the Great. He used this Latin expression "In hoc signo, vinces" ( "In this sign you shall conquer") to describe the fiery cross he saw in the sky at his own conversion to Christianity and that of his thousands of Roman soldiers and Roman citizens at the beginning of the fourth century of Christendom. "John Hardon, S.J. often said that "Catholics should not be afraid to say their grace before meals with the sign of the cross in public" in order to obtain God's graces and blessings. Even if this be in restaurants, in halls, or what have you. What miraculous wonders of evangelization await each and every orthodox Roman Catholic believer who proudly wears the crucifix of Our Lord Jesus Christ upon his breast and prays daily for the conversion of Islam and all non-believers!